Snuggle up to your honey for the romantic finale to our Winter Film Festival at Citi Pond, timed perfectly to get you in the mood for love's favorite day. Lady and the Tramp will screen twice this Monday, February 13th - at 5:30pm and 7pm. Book a romantic table with a view at Celsius or take a few spins around the ice with a lover or a friend while you watch. Celsius will be in full romance mode the following evening too with a traditional four course prix fixe menu in celebration of Saint Valentine's Day. 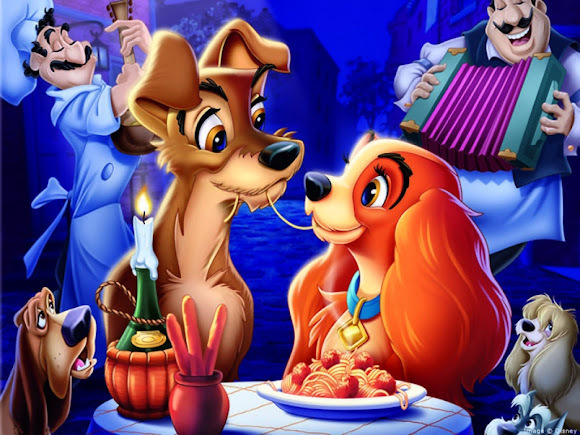 Lady in the Tramp is a beloved Disney tale of two star-crossed dog-lovers. While New York Times reviewer Bosley Crowther admits this is not Disney's finest work, the romance and charm are laid on thickly. Perfect for Valentines. Walt Disney is back in the feature cartoon business with "Lady and the Tramp," a tale of a female cocker spaniel, which came to the Roxy yesterday. After wandering away from the reservation with such eminent but extraneous films as his True Life nature documentaries and live-action dramas of personalities such as Robin Hood, Rob Roy and—well, a fellow who was a buck-skinned frontiersman in Tennessee—he is back at the sort of story-telling with animated characters for which he is most famed. And he is mining again that vein of whimsey from which he has got some of his most memorable films. "Lady and the Tramp," we might mention, is not the best he has done in this line. It is a coyly romantic story, done with animals. The sentimentality is mighty, and the use of the CinemaScope size does not make for any less awareness of the thickness of the goo. It also magnifies the animation, so that flaws and poor foreshortening are more plain. Unfortunately and surprisingly, the artists' work is below par in this film. Conventionally, the romance blossoms in what might be called puppy-love terms, and Tramp proves himself an eligible suitor when he kills a horrible red-eyed rat that gets into Lady's home. (Mr. Disney and his fellows must have their sadistic kicks.) The yarn ends with Tramp and Lady raising a genteel brood of their own. But there are some charming things in this picture. A laughing hyena and a beaver in the zoo to which Tramp escorts Lady during her excursion into the world are in the best Disney style. Two Siamese cats that come to visit in Lady's home are superbly droll, too. Their slinky contortions and vandalisms convey a neatly satiric mockery. And the song they sing, with Peggy Lee doing the vocalizing, is the niftiest song number in the film. Also, the various types of canines that are burlesqued in human terms are amusing—if you like canines endowed with the mannerisms of human beings. The musical score has tinkle, and it is rather nicely sung by Miss Lee, the Mello Men, George Givot and several others who are the voices of the dogs. Mr. Disney's affection for dogs is more sugary than his appreciation of mice and ducks. But this should suit the taste of many people who go for lap-dogs and such. Included on the program with this feature is a half-hour Disney travel film about Switzerland, which—in the Disney manner—shows the more rustic and idyllic facets of Swiss life. Alpine villages, skiing and festivals make up the bulk of this beautifully photographed CinemaScope color film. LADY AND THE TRAMP, an animated feature cartoon; story by Erdman Penner and Joe Rinaldi, from a story by Ward Greene; directed by Hamilton Luske, Clyde Geronimi and Wilfred Jackson; songs by Peggy Lee and Sonny Burke. Produced by Walt Disney and released by Buena Vista Film Distribution Company. At the Roxy.